Have you been to Kanazawa city, Ishikawa prefecture? Don't you have any plan to visit there at the beginning of November? As I posted earlier, the annual two-days Wakocha (Japanese black tea) event will be held on both 1st and 2nd of November. 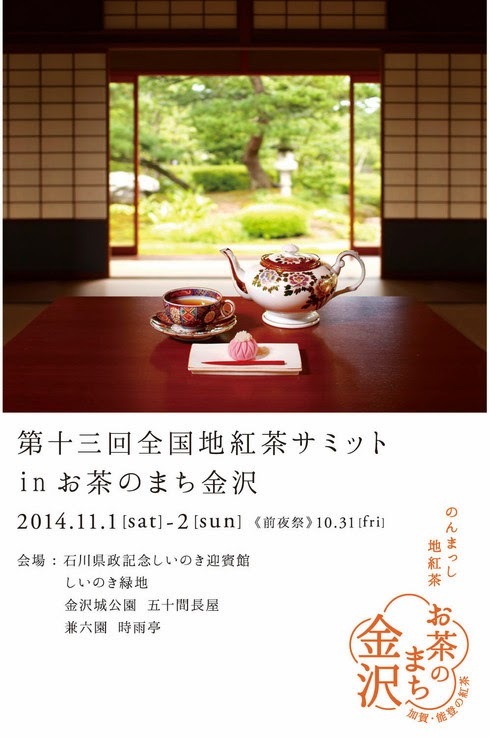 When you visit Kenrokuen garden, you will enjoy Wakocha tea ceremony. When you come to Kanazawa castle park, you can meet the tea farmers gathering from all over the country and sample tea from all over the country. If you are lucky to find your taste, you can get. It will be a perfect opportunity for you to explore Japanese black tea. Steep Wakocha and steep yourself in Wakocha!